Jousting is a medieval sport that originated between the 10th and 13th centuries. Jousting tournaments began as organized battles between knights who'd had a disagreement. Two or more knights on horseback fought with lances, battle axes, daggers, and/or swords. Jousting wasn't popular until after the 12th century and remained so until the 16th century. Jousting tournaments became a great way for knights to show off their skills and to win lots of money. They also risked losing their lives. Henry II of France was one of the first men who lost his life to a jousting tournament. A knight would select a beautiful lady whose husband was ideally of higher rank than him. The knight would then fight in her "honor". Chivalry wasn't as romantic and filled with honour as it's been portrayed! This, and the brutal violence of the tournaments outraged the church. For this reason The Statute of Arms for Tournaments was established in 1292. These tournaments dubbed all Knights as gentlemen and required them to abide by the rules of fair play. As the 13th Century ended, jousting took a new turn. Tournaments became less like brutal death matches and more like civilized entertainment. Tournaments were fought with blunted weapons, death was rare, when before it was expected. Killing a horse had always been considered an inexcusable and horrific act. The knight's objective was no longer to kill, but to knock the other knight off his horse. The knights also tried to destroy their lances as this won them more respect and prestige. The amount of lances a knight broke was an indication of the force of his charge and his horsemanship skills. There were three types of tournaments up until the 17th century. They were: Melee' or Tourney Proper, Individual Joust, and Practice Tournament. Melee' was popular during the 12th and 13th century when tournaments were extremely brutal and violent. Lives were lost in Melees. There were more than two competitors. The goal was to be the last one standing by unhorsing as many of the others as possible. Individual jousting was a battle between two knights and was a lot more civilized. If a knight were to hit either his opponent or his opponents horse he would be disqualified. The goal was to hit the other , knocking him off his horse or shattering the lance. In 1420 a wall was introduced to help prevent injury to the horses. The Practice tournament was exactly as it implies. A quintain (wooden target mounted on a pole) was set up and if hit off center it would swing around and unseat the knight. The rings were less dangerous. A ring was suspended from a cord, and the Knight was to pick it up on the tip of his lance. It is known as "The riding of the rings" and is the longest lasting of the tournaments. It's still associated with chivalry, but not in the same adulterous sense of the past. The winning knights were awarded kisses from the ladies. The sport of jousting came to be a test of both horse and rider's physical strength and coordination, rather than a bloody battle that often resulted in death. 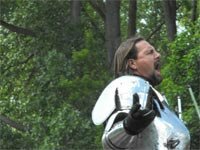 At the Great Northern Medieval Fayre, you get to see a show based on both the authentic Medieval Individual Jousting and the Practice Tournament.